We've been perfecting the Model 77 countertop filter since the late 1980s. We think it's the best standard countertop filter that can be made. We use the best parts available, offer a varied selection of vessel and filter cartridge styles, and give a long guarantee. Long, as in lifetime. We support the Model 77 completely — if a part fails, call and we'll replace it. It's sold as a lifetime appliance, something you can depend on to provide safe and delicious water for as long as you keep it serviced. And the price is still just $77 for all models. Installation is quick and easy. You can easily service this filter yourself with no special tools. A good countertop filter is a versatile, dependable tool. You can use it at home, take it with you when you travel, or move it easily if you change your place of residence. You can quickly and easily convert it to a “gravity” filter for camping or emergency purposes. The simple one-piece conversion kit is free for the asking when you purchase the unit. Go here to read a lot more reasons why you won't find a better countertop filter than our Model 77 anywhere. The easy way: Choose the standard model. This is the most popular format and it's the standard vessel, with a gooseneck spout and the MatriKX CTO+ carbon block cartridge. It's our unchallenged best seller, for a reason. It's an attractive, superb performer in all situations—city water or well water. It's the first unit below. The housings are described & pictured in the ordering table below. Finally, choose a filter cartridge. Any standard 9.75" X 2.5" filter cartridge — the most common size made — will fit the standard unit. We recommend especially the cartridges listed below, but you can also choose other selections from our Cartridge Menu. Prices for all Model 77 Styles are the Same: $77! To order, choose the vessel style. In the shopping cart, you'll be asked to choose a cartridge and a spout style. You can also order by calling (940) 382-3814. This is our most popular style. Perennial Best Seller, Classic White Low-Ribbed Vessel. We call this model “The King.” The standard cartridge is the MatriKX CTO+, but you can get it with others at no extra costs. This is a tough vessel that can be converted to undersink use if desired. Accepts Full-Sized 9.75" X 2.5" Cartridges. Stainless steel spouts are offered in two styles. The standard style is Gooseneck. Note: Model 77 comes equipped with a filter cartridge, so you won't need a replacement for a year. The price of the unit is $77, regardless of the cartridge chosen. Our most popular cartridge is the MatriKX CTO+. 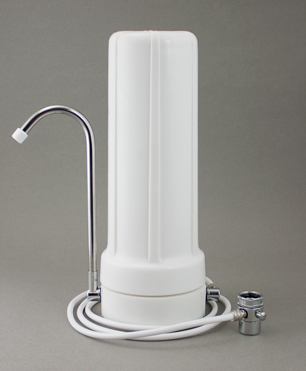 We use it in all of our countertop, undersink and reverse osmosis units. The CTO+ is the recommended cartridge for standard Model 77 units. It's what you'll get if you don't specify a cartridge. 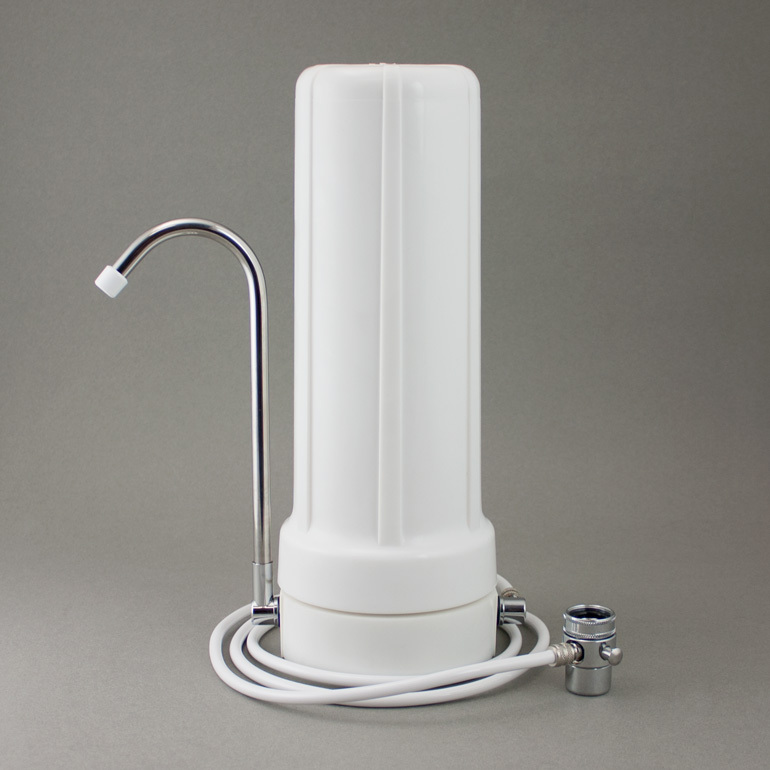 Parts for all standard countertop water filters, including housings, spouts, diverter valves, spout and tube elbows, o-rings, tubing, faucet adapters and more. (or any countertop filter) to an undersink unit. We have an inexpensive kit that makes it easy.